Leo, the Lion, is a Fire sign ruled by the Sun and covers those born between 23rd July and 22nd August. In Babylonian astronomy, the constellation was called UR.GU.LA, the "Great Lion"; the bright star Regulus was known as "the star that stands at the Lion's breast." Regulus also had distinctly regal associations, as it was known as the King Star. In Greek mythology, Leo was identified as the Nemean Lion which was killed by Heracles (Hercules to the Romans) during the first of his twelve labours. The Nemean Lion would take women as hostages to its lair in a cave, luring warriors from nearby towns to save the damsel in distress, to their misfortune. The Lion was impervious to any weaponry; thus, the warriors' clubs, swords, and spears were rendered useless against it. Realizing that he must defeat the Lion with his bare hands, Hercules slipped into the Lion's cave and engaged it at close quarters. When the Lion pounced, Hercules caught it in midair, one hand grasping the Lion's forelegs and the other its hind legs, and bent it backwards, breaking its back and freeing the trapped maidens. Zeus commemorated this labour by placing the Lion in the sky. 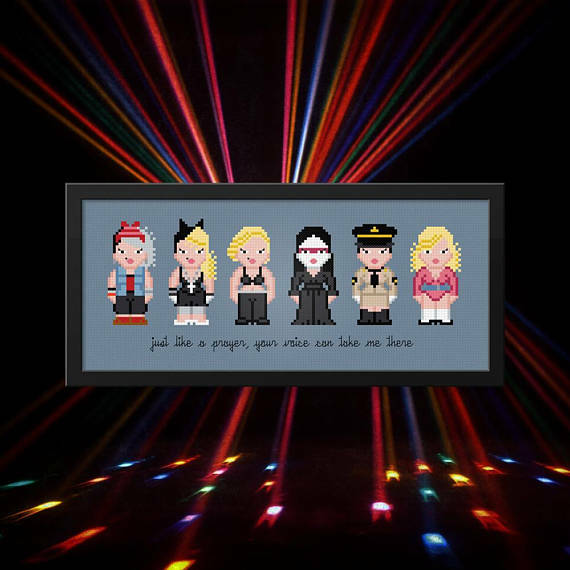 There are loads of different Harry Potter themed cross stitch for J.K so I decided to go for Madonna with this array of costumes she has worn. Which Madonna is your era? I am not going to show the whole piece as I am so close to finishing, you'll have to wait until next month! I love all the little embellishments in this for each anniversary. Not sure who the designer is, it was in a stitching magazine. So, let's hand over to you! This is the place for you to link up if you want to join in, please link to the actual blog post, not your blog homepage and include your name so we can see who has joined in. 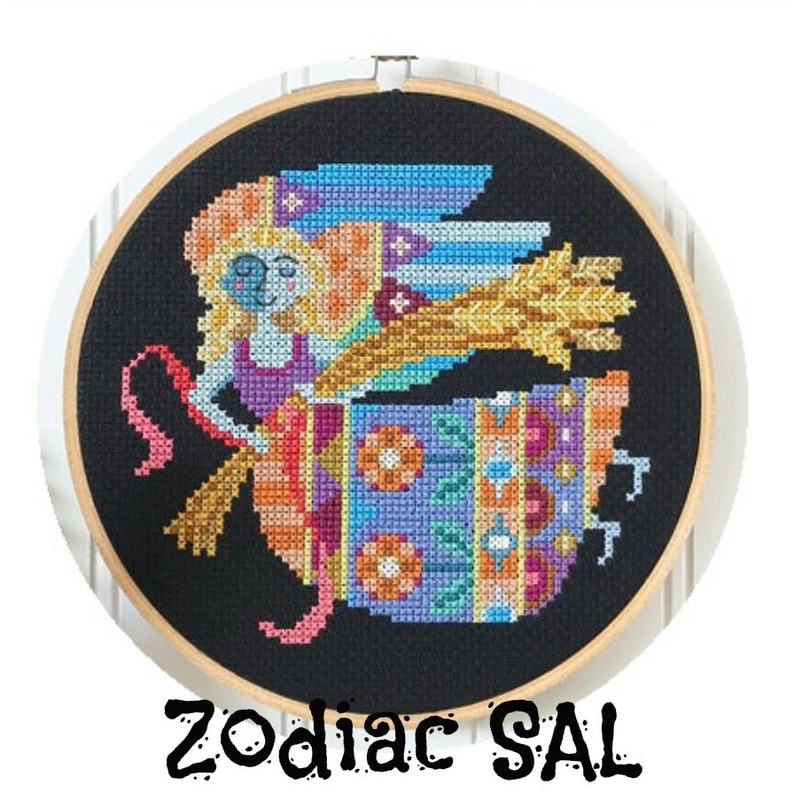 Finally, next month is the final month of the Zodiac SAL. I hope you have enjoyed each month and learned a little bit about each star sign. Some of them were very accurate and some were completely unrecognisable according to the comments left. We have got the best saved until last - next month we learn all about MY star sign. Then after that I have a plan for the next Saturday SAL. So stay tuned for that announcement. Oh Jo where do you find the time from ,with all your lovely stitching and interesting posts ,I love coming over to see everything that you are . Always love your posts. Enjoy your weekend . What a wonderful piece you stitched for your Grand parents. My Mom was a Leo. In some ways she sounded like the description and in other ways not so much. Leo is my sign. It fits my sister who is exactly a year younger more than me. I did not know this was a Saturday SAL. What fun! Hope I can join next year. I love the projects that you stitched Jo. The piece for your Grandparents is gorgeous. 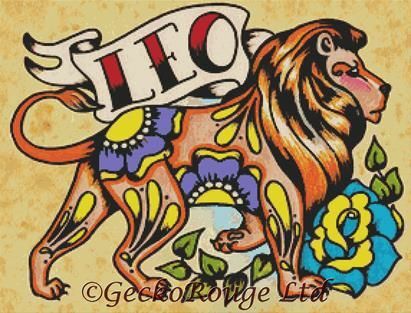 My son and husband are also born in Leo. Your SAL looks great. 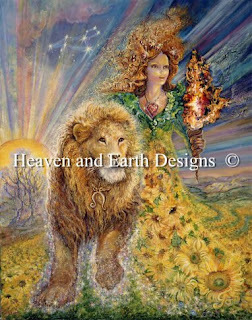 I love the lion from the Donna Kooler series, and also the lion that Josephine Wall designed. This HAED looks really awesome. I have two family members who are lions and the positive characteristics in the little article perfectly describe them. I love the Wedding Anniversary sampler you stitched for your grandparents. I once saw the pattern in an older cross stitch magazine and thought that I should save it for some future stitching. But it never came to that. The anniversary sampler is wonderful! Not a huge Madonna fan, but the Obama piece is cool. Your Anniversary stitch is impressive and how lovely that your grandparents enjoyed it and now it has come back to you to enjoy. I'm looking forward to seeing your SAL completed next month! I love your DK Lion, he is royal! Bluffing chart, small stitching but so many details. 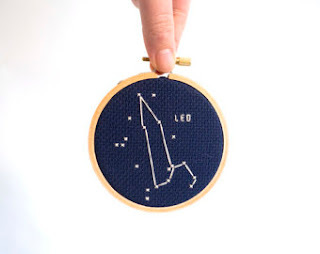 Your Leo lion turned out really cute! I can't wait to see the whole piece. Beautiful stitching! My best friend is a Leo and boy you described him very well. I never knew. Too funny. Can't wait to hear what you have in mind for your next Saturday SAL. I love the sampler you made your grandparents, it beautiful! So nice that you got it back to continue to enjoy it. Another interesting zodiac post, Jo! I don't think I know any Leos--weird!! I've always loved Madonna's early stuff. It think the last CD I bought of hers was the Vogue one. But have to say I don't listen to her music anymore. But I do love love love your parents wedding anniversary sampler. Lovely and sparkly I bet they hung that in a place of pride. What a lovely wedding sampler! I can look forward to the sixth year with great gusto ahaha. The way Leo is squishing his O is fantastic! I know several Leos. Many, many Leos. In fact it's a family joke about the amount of August babies on my mother's side! 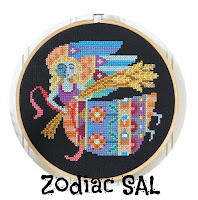 It's kind of nice that we have a circle of stitchers for this SAL small enough to miss someone who misses one post! Leo doesn't sound like a very friendly name sake for a sign...thankfully, Leo people are much nicer than the lion himself! My granddad is a Leo, but the description doesn't fit him at all. But a friend of mine is a Leo as well and he's an actor, so that's one out of two!